The quest for energy independence has more to do with pipelines than we realize. When Americans clamor for energy independence, the focus of said clamoring typically falls on increasing oil and gas production. But what most advocates and proponents don't realize is that energy independence is impossible right now -- not because of natural resources, but because we lack the midstream infrastructure to process and transport our domestic energy supply. Midstream assets, specifically pipelines and processing centers, are more crucial than we think and will play a key role in America's energy future. The image below is a snapshot of our natural gas pipeline infrastructure. There are plenty more pipelines that carry oil. 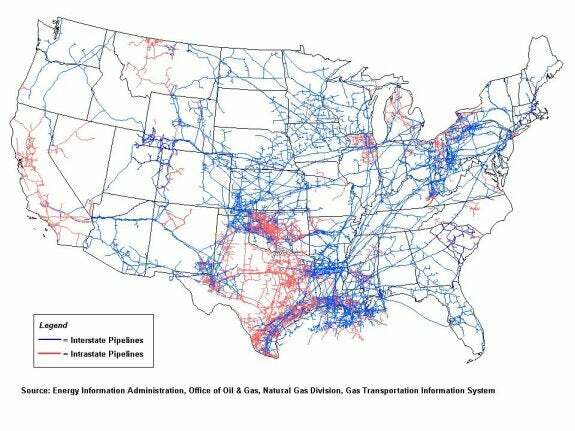 The point is obvious, though: We have a lot of pipelines. And yet, our current infrastructure cannot meet the demand of our booming domestic energy production. America's pipelines are regulated by the Federal Energy Regulatory Commission. FERC sets the rates of transmission and keeps an eye on a host of other details, like the quality of gas traveling through the pipeline. Gas has to be processed to meet pipeline requirements, which typically means that natural gas liquids, crude oil, and dry gas need their own infrastructure. Right now, you can see the implications of this system in the Bakken shale. Companies such as Kodiak Oil & Gas are producing great quantities of oil, but great quantities of gas are produced as well. Because there is no infrastructure in the region to bring this gas to market, it is burned off at the site in a process called flaring. And while we're on the subject of the Bakken, not only does the area lack infrastructure to bring gas to market, but its oil pipelines have reached capacity as well. In 2005, the Bakken was pumping out 100,000 barrels a day, but today that number has increased dramatically to nearly 600,000 barrels a day. Awesome! Or it would be, except that pipeline capacity coming out of the region taps out at 425,000 barrels a day. Capacity expansions won't come online until mid-2012. In the meantime, producers will ship excess oil via rail, and we will continue to watch oversupply drive down the price of oil at hubs like Clearbrook, Minn., and Cushing, Okla.
Pipelines play a crucial role in the supply-and-demand game that controls the price of oil. If producers flood oil hubs with more oil than can be pushed out to refineries via existing infrastructure, the price of oil drops. Cheap oil is only good when the discount gets passed along to consumers. Unfortunately, that can't happen in the case of the Bakken because much of the price difference evaporates when producers utilize other modes of transportation to get the oil to refineries. It is much more expensive to transfer oil by train than pipeline. Not only that, but because of the technology used to extract oil from shale, if the price of oil from the Bakken drops too far, it becomes cost-prohibitive to produce. That's bad news for small oil and gas outfits and America. Richard Kinder's companies are waiting on regulatory approval for their big acquisition of El Paso, but the company is incredibly busy outside of that deal. Keep an eye on Kinder Morgan's Trans Mountain expansion project. Trans Mountain is currently the only pipeline connecting Canada's oil sands to the Pacific Coast. Once it secures commitments from Canadian drillers, KMI plans to expand the pipeline's capacity from 300,000 to 600,000 barrels a day. Enterprise plans to expand its natural gas and natural gas liquids operations in the Eagle Ford shale. The company anticipates adding pipelines, increasing cryogenic and compression capacity at its Yoakum facility in South Texas, scheduled to come on line in 2013. The company also has sufficient commitments to develop its Appalachia-to-Texas ethane pipeline. The 1,230-mile pipeline will bring gas from the Marcellus and Utica shales to the Gulf Coast. Sometimes I wish that "Keystone XL" was just slang for a 22-ounce can of Keystone Light, but alas, it is not. We have extensive coverage of TransCanada's infamous pipeline project, but I encourage Fools to keep an eye on the company's other pipeline projects. Specifically, the Alaska Pipeline Project, which is currently, wait for it, stalled! TransCanada and partner ExxonMobil have been unable to secure shipping contracts, and Alaska Gov. Scott Parnell has publicly suggested the state consider alternatives for handling its North Slope energy. TransCanada is moving ahead with the required FERC applications, but if it can't line up customers, there is nothing doing here. The company is desperately hoping its Northern Gateway pipeline gets approval soon. The project would connect Alberta's oil sands to British Columbia, and though it has the support of the Canadian government, it faces opposition from environmentalists and aboriginal people that would make Keystone XL haters blush. Enbridge remains confident the pipeline will eventually be built. The energy industry will spend an estimated $130 billion to $210 billion expanding natural gas infrastructure over the next 20 years. In the near term, 78% of the 8,887 miles of pipeline that are planned for completion in 2012 are for natural gas. Looking further into the future, this trend shifts, as crude and NGL projects increase and gas pipeline projects decrease. One thing remains clear: For American energy independence to become more than just a pipe dream, we must support midstream development. As midstream advances bring more gas to market, tangential plays will become more and more popular. Get a head start on the market with a small company Fool analysts recommend for interested investors.